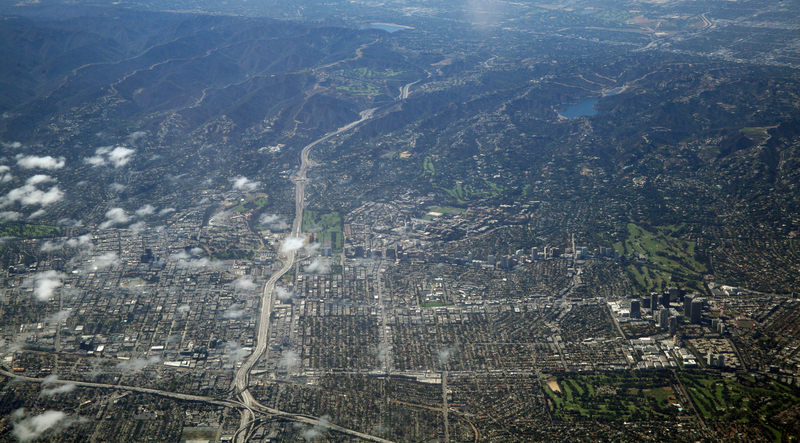 The Sepulveda Pass from south to north as seen from a plane. Photo by Doc Searls via Flickr creative commons. In a significant initial step to bring a transit line through L.A.’s notoriously congested Sepulveda Pass, Metro on Wednesday issued a Request for Proposals to study the feasibility of various transit modes and alignments. The project is one of the highest profile projects included in Metro’s recently approved Measure M transportation sales tax measure, and would connect the San Fernando Valley and Westside region of Los Angeles with a high capacity transit line. Approximately $1 billion in funding is available through Metro’s 2008 Measure R transportation sales tax. Another $6.8 billion for transit and freeway corridor improvements is identified through the Measure M transportation sales tax and other funding sources. With the RFP, Metro is seeking a consultant to identify and evaluate a range of high-capacity transit concepts that could serve the 11-mile north/south travel corridor connecting the Metro Orange Line in the San Fernando Valley with the future extension of the Metro Purple Line at the Wilshire/Westwood or VA Hospital stations and the Expo Line. A number of alignments and terminal station locations will be considered. Transit modes that will be evaluated include bus rapid transit, light rail, subway and other proven transit technologies not currently operated by Metro. The study is expected to take approximately 14 months to complete. The Sepulveda Pass Transit Corridor Project has an ultimate delivery date of 2033. Metro is seeking ways to expedite project delivery. Through Metro’s Office of Extraordinary Innovation, the agency has received two unsolicited proposals for Public Private Partnerships to accelerate the project. The feasibility study will help with the review of these industry proposals. Metro’s study will also coordinate with the ongoing ExpressLanes study now being conducted by the agency’s Congestion Reduction Department. This project — also with funding from Measure M — would build toll lanes on the 405 between the 101 and 10 freeways. In November 2012, Metro completed a ‘systems planning’ study that defined broad concepts and financial strategies for possible transit options for a 30-mile corridor area between Sylmar and Los Angeles International Airport. That study ultimately found there is a strong potential for transit improvements specifically in the Sepulveda Pass Corridor between the Metro Orange Line and the Metro Expo Line. Between 60 and 80 percent of daily transit boardings for the full 30-mile corridor were forecasted to occur at stations within this middle segment. The I-405 Freeway is ranked as one of the most traveled urban highways in the nation. It accommodates approximately 300,000 vehicles per day. According to the Federal Highway Administration, that number is expected to grow by nearly 50 percent to 447,000 by 2025. For additional project information, please visit https://www.metro.net/projects/sfv-405/. Fingers crossed that Metro will think long-term on this project and go with an HRT tunnel that extends down to LAX. The ridership will be phenomenal on this line. If money needs to be saved, the Orange Line to Sylmar portion could probably be served well with BRT rather than rail. One minor plea to Metro officials: please locate the UCLA station at Ackerman Turnaround / Gateway Plaza, as recommended in 2012! Yes, I agree. A station at Ackerman is Ideal. It would serve the 10k plus employees UCLA has. Sylmar to Westwood NEEDS to be light rail; no forced transfer from HRT to BRT like the Red/Orange Line in North Hollywood. I do agree with needing a station at the UCLA Ackerman loop where Big Blue buses turn around. A new heavy rail for this project please. Section b/w Sylmar and Van Nuys/ Sherman Oaks can be used aerial, and underground section south of Sherman Oaks/ Van Nuys and all the way to LAX in the future. We could have the new heavy rail in LA soon. For the volume of riders that would be using this line to connect to the Purple Line (and hopefully LAX) from the Valley, it should be a heavy rail train. Those two- or three-car light rail trains won’t cut it for that kind of ridership; it’ll be worse than the crowding we saw on the Expo Line when Phase Two opened to Santa Monica. DON’T BE IDIOTS! DON’T BE IDIOTS! This incredibly busy route needs to be rail. Preferably a full subway, but a high-capacity light rail would be OK. Anything with buses would be idiotic. By high-capacity, I mean make the platforms long enough for six-car light rail trains, not just three-car trains.